A serendipitous browse in a box of old postcards can sometimes yield an interesting genealogical project. And that is what happened to me when I wandered into the Shelburne Falls, (Massachusetts) Booksellers on an evening in November 2015 to peruse this small antiquarian bookshop. 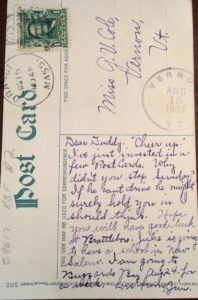 A box of greeting postcards on a shelf caught my eye, especially the one that makes this story. It is a sweet, colorized greeting card of Haine’s Brook, located in the town of Orange, Massachusetts. The bucolic scene of the rushing brook features a young girl in a rose colored dress, reclining on rocks next to a waterfall, fishing in the brook, and to her right, higher on the rocks, is a young boy also fishing. The postcard was printed in Frankfurt, Hesse, Germany. The correspondence side of the card is penned in ink to a “Miss G. V. Cole, Vernon, Vt.” from “Jim.” It was mailed from Orange, Mass., and postmarked August 15, 11:30 AM. Interestingly, the postcard had a second cancellation and was received by G.V. on August 15, 1907. The year 1907 saw many changes in postal regulations for post cards in the United States, and from that year through World War I became known as the “Golden Era” of postcards. The new law allowed messages to be written on the backs of the post card, whereas before that date, all personal messages were relegated to the front of the post card or in a small blank space also on the front. A vertical dividing line down the center of the post card separated an area for correspondence from the address, which became known as the “divided” back era. Ms. Cole’s post card included these “new” developments. My first investigation into the identity of G. V. Cole was to search Ancestry.com for any records nearest to the date of the postmark. I suspected that Miss Cole was young, and probably single. I found a marriage record index entry for a Gertrude Vera [not Violet] Cole, age 18, in the Town of Vernon, Vt., who had married Everett E. Stockwell on January 15, 1909. She was residing in the town of Prescott, Ma. The officiating clergy was Mr. Edmund Smiley, a Methodist minister from Orange, Massachusetts. Her husband Everett had been a resident of Vernon at least since 1900. The Stockwell-Cole family was not found in the U.S. Census in 1910, however, a record was discovered in Massachusetts directories of Springfield, Massachusetts for the years 1911-1915. Looking forward in years to the 1920 Census, the Stockwell-Cole family was living in Vernon, Vt. with two children, Marion E, who was 10, and Howard E. who was 6. There was also a record for an infant Stockwell who apparently died at childbirth in 1911. In the 1930 U.S. Census there are two households for the Everett’s, but this likely was not due to marriage difficulties or separation. Everett was the superintendent of a power plant in Vernon, and his house was in an enumeration district where many of the workers lived. Perhaps it was a construction site for a new dam. Gertrude V was listed as a lodging housekeeper who lived at 73 Elliott St. in Brattleboro. Two sons, Howard (age 16) and Richard (7) lived with her. A daughter, Marion E. (21), was already gone from the house. In 1940 Everett continued his career and was the superintendent of the Harrison Electric Power station in Readsboro, Vt., and the family lived there. All three children (Marion, Howard, and Richard) had moved out of the house and did not live with their parents. Sometime after 1940, Gertrude and Everett returned to Brattleboro. The last address I was able to locate through an online city directory was on Meadowbrook, Rd., Brattleboro, in 1960. More questions still remain to be explored. Who was the postcard author, Jim, who had just invested in some “Post Card,” and was going to Buzzards Bay, Ma. in two weeks? Who was driving Duddy around and did not stop to see Jim. What did Jim mean by, If he cant [sic] drive he might surely hold you in I should thin?. And who was this mutual friend, Julie, who was to begin teaching at a school in New Salem, [Ma.?]? 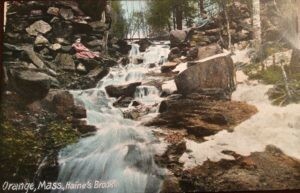 And where does this lovely “Haine’s Brook, Orange, Ma,” actually exist that began my steps through the portal of time? Guy Clark, Real Photo Postcards KwikGuide: A Guide to Identifying and Dating Real Photo Postcards of the 20th Century, (PhotoTree.com: n.p. , 2013), 17. Vermont Vital Records, 1760-1954,” Gertrude Violet Cole,” database with images, FamilySearch (https://familysearch.org/ : accessed 7 February 2018), Film #004093903 > image 5179 and 5180. Citing Vermont State Records and Archives Service, Montpelier. “Vermont Marriage Records 1909-2008”, database, Ancestry.com (http://ancestry.com : accessed 1 April 2016), entry for Cole, Gertrude Vera and Everett E. Stockwell, 15 January 1909; citing Vermont State Archives and Records Administration; Montpelier, User Box Number: PR-01920; Roll Number: S-30695; Archive Number: M-1984644. 1900 U.S. census., Windham County, Vermont, population schedule enumeration district (ED) 261, sheet no. 4 (penned), dwelling 89, family 95, Everett Stockwell, NARA microfilm publication T623, roll 1696. 1910 U.S. census, Windham County, Vermont, population schedule enumeration district (ED) 127, sheet no. 1(penned), dwelling 21, family 25, Everett Stockwell, NARA microfilm publication T625, roll 1876. Massachusetts, City of Springfield, Standard Certificate of Death no. 1565, ——– [infant] Stockwell, 14 December 1911, City Clerk’s Office, “Massachusetts, Death Records, 1841-1915,” database, Ancestry.com (http://ancestry.com : accessed 1 April 2016) citing Massachusetts Vital Records, 1840–1911. New England Historic Genealogical Society, Boston. 1930 U.S. census., Windham County, Vernon, Vermont, population schedule enumeration district (ED) 13-4, sheet no. 13A(penned), dwelling 73, family 246, Everett Stockwell, NARA microfilm publication T626, roll 2432. 1940 U.S. census., Bennington County, Readsboro,Vermont, population schedule enumeration district (ED) 2-24, sheet no. 1A(penned), Harrison Power Station, Everett Stockwell, NARA microfilm publication T627, roll 4229. Vermont, Brattleboro, Certificate of Death no. 02441, Everett Elijah Stockwell, 5 July 1977, Department of Health,“Vermont, Death Records, 1909-2008,” database, Ancestry.com (http://ancestry.com : accessed 1 April 2016) citing Vermont State Archives and Records Administration; Montpelier, User Box Number: PR-02132; Roll Number: S-31432; Archive Number: PR-1476-1477. Vermont, Brattleboro, Certificate of Death no. 03190, Gertrude Vera Stockwell, 1 September 1981 , Vermont Department of Health, “Vermont, Death Records, 1909-2008,” database, Ancestry.com (http://ancestry.com : accessed 1 April 2016) citing Vermont State Archives and Records Administration; Montpelier, User Box Number: PR-02132; Roll Number: S-31432; Archive Number: PR-1476-1477. Jim [unknown] (Orange, Massachusetts) to “Dear Duddie” [G.V. Cole], postcard, 15 August 1907; privately held by Jerry Carbone, [address for private use,] Brattleboro, Vermont, 2015. The First time “State of Vermont” appears on a map.